6. Are Currently Described Species of Echinococcus Evolutionarily Independent? Echinococcus and Echinococcosis Part A and B present a complete synthesis on what is known about the parasitic cestode echinococcus and the disease it causes, echinococcosis (Hydatid Disease), also demonstrating that in addition to its medical, veterinary, and economic significance, it is an intriguing biological phenomenon. 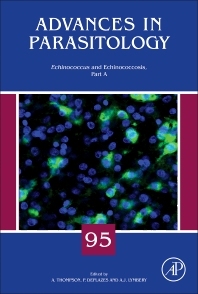 Both parts build on the success of a previous volume, Echinococcus and Hydatid Disease, edited by R.C.A. Thompson and A.J. Lymbery, and published by CAB International, that details the major advances that have taken place since its release. As such, it remains the only comprehensive account that embraces virtually all aspects of echinococcus and the disease it causes. The links between laboratory knowledge and field applications are emphasized throughout the volumes. Consequently, research workers, teachers, students of parasitology, clinicians, and field workers will find this work an indispensable source of information.